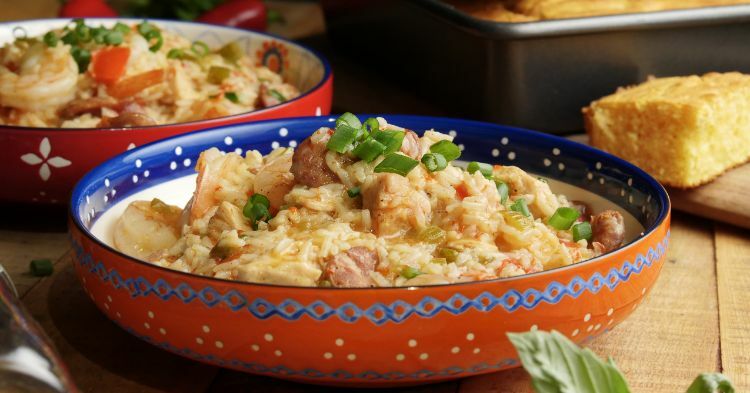 The popular Louisiana dish jambalaya draws influences from the cuisines of Africa, France, and Spain. Both Creole and Cajun cooks make this rice-based, one-pot meal that starts with spicy smoked sausage and a mixture of onion, celery, and bell pepper, considered the "holy trinity." They often add other meats and seafood, along with rice and broth. Jambalaya is an easy and economical meal that is full of intense flavor. 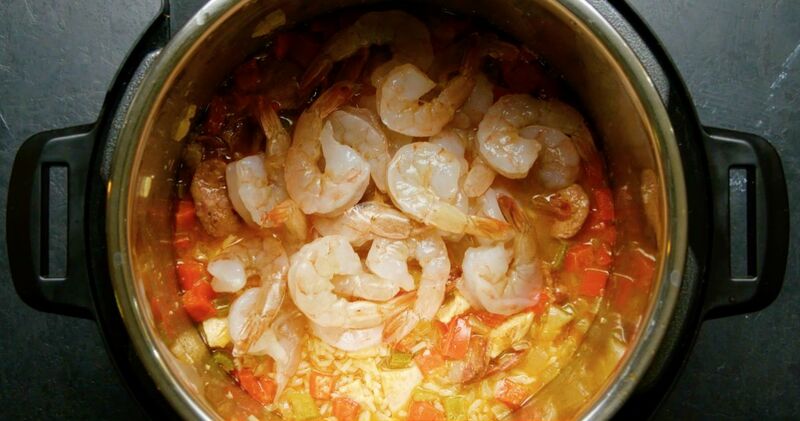 In New Orleans and surrounding areas, Creole cooks add tomatoes to the pot, turning it into a “red” jambalaya. Cajun cooks who live out in the bayous and other remote areas didn’t always have easy access to tomatoes. Instead, they browned their smoked sausage and used the rendered drippings to create a flavorful sauce that forms the base of this Cajun jambalaya recipe. Add the sausage, onion, bell pepper, garlic, and celery to the pot and cook, stirring frequently, until the sausage is browned and the vegetables have softened, for about 8 minutes. Add the chicken to the pot and cook, stirring occasionally, until the chicken turns opaque, for about 3 minutes. Add the broth, Creole seasoning, salt, and rice. Stir to mix. Close the lid of the pot and turn the valve to the sealing position. Choose high pressure and set the timer for 7 minutes. When the cooking time is up, quick release the pressure and turn the pot off. Stir in the shrimp, and scallions. Replace the lid, but leave the pot turned off, and let it stand for 10 minutes. The residual heat will cook the shrimp.